November 20, 2018 Patrick Nemechek, D.O. Over the last six years, advances in neuroscience have begun unraveling the mystery of a population of cells within the brain called primed-microglia. Primed-microglia are an inflammatory and destructive form of white blood cell that are triggered by 4 different known mechanisms; encephalitis (brain tissue infection), repeated brain trauma such as that occurring in the professional football, high exposure to diesel fumes as can occur in cities such as Mexico City and Shanghai and the most common is an overgrowth of intestinal bacteria called SIBO (small intestine bacteria overgrowth). SIBO is relevant to almost all of us today as it is thought that the majority of the population is affected by SIBO to some degree and that the incidence increases especially in those over age 65. SIBO can ultimately be triggered by a course of antibiotics, a vaccination, general anesthesia and occurs in 40-50% of patients who undergo some form of abdominal surgery. The primed-microglia inhibit stem cells (cells that can replace any other form of cell in the body, the ultimate spare part) and neurotrophins (think of these as chemical hammers and screwdrivers) and prevent the brain from completely repairing itself after common physical, emotional and inflammatory traumas. Common brain trauma from run-of-the-mill physical, emotional, and inflammatory injuries results in a small amount of residual brain damage that would have been repaired had it not been for the primed microglia. Once the microglia are primed, each seemingly innocent injury leads to a small residual amount of brain injury that negatively affects brain function. At first these are not noticeable but with time their cumulative effect becomes apparent. The residual damage left behind result in the slow and steady accumulation of brain damage known as cumulative brain injury, and symptoms reflective of the area of the brain in which the damage is accumulating slowly begin to increase. A wide variety of studies have identified brain injury (described as concussions or mTBI) suggest cumulative brain injury is the primary cause of symptoms in Alzheimer’s, Parkinson’s, ALS, ADD/ADHD, chronic depression, PTSD, schizophrenia and CTE in professional football players. 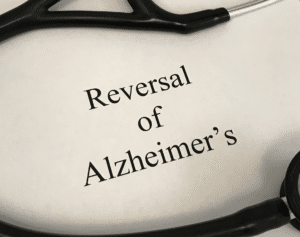 Fortunately, The Nemechek Protocol® was designed to shift the harmful inflammatory microglia into their healthy, repairing mode of behavior (called phenotypic shifting) and allow the brain’s natural repair mechanisms to reverse the cumulative brain injury. Developed over 15 years during Dr. Nemechek’s research on the effects of chronic HIV infection on the autonomic nervous system, The Nemechek Protocol® is very effective at reversing the underlying damage contributing to both autonomic dysfunction and the dementia associated with Alzheimer’s. Dr. Nemechek presented the recovery of Alzheimer’s dementia and autonomic dysfunction at the International Neuromodulation Society 13th World Congress in Edinburgh, Scotland (May 2017). Within approximately 8 months, these 2 individuals had regained their ability to cogently converse within 8 months of starting the protocol. By combining the unique anti-inflammatory power of vagus nerve stimulation along with rebalancing of the intestinal tract and the core components of the Mediterranean diet (fish oil, olive oil, and nuts), Dr. Nemechek is able to successfully reverse the cognitive dysfunction associated with Alzheimer’s dementia. Transcutaneous vagus nerve stimulation (tVNS) is the most powerful and unique component of this regimen. The Vagus nerve carries the signaling from the parasympathetic branch of the autonomic nervous system and is responsible for the control of normal healthy inflammation throughout the body. Inflammation is a healthy reaction that allows the body to normally repair damaged tissue and fight infections. If left uncontrolled, inflammation not only prevents the nervous system from repairing itself after traumas, the inflammation can directly damage tissues (cardiovascular disease, degenerative arthritis, Vagus nerve damage, chronic pain, etc.) but will also trigger the genes within a person’s DNA leading to diseases such as diabetes, autoimmune disorders and cancer. The most common VNS devices that are available are surgically implanted and only used for treatment-resistant epilepsy and depression. Fortunately, there are VNS devices that can stimulate the Vagus nerve through the skin of the ear (transcutaneous) that are equally as effective as the implanted devices. The Nemechek Protocol® is an extraordinarily effective and safe approach in the fight against Alzheimer’s dementia. ©️ 2018. Nemechek Consultative Medicine. All Rights Reserved. Dr Nemechek, have you seen this recent study about using a lysophospholipid form of EPA? The study showed it increased EPA levels in the brain 100 fold. What do you think about it? How do we go about getting a lysophospholipid form? I can’t find any information on it. Thank you for your work. I’m 6 months on the protocol and try to tell everyone I know about it! Simple fish oil works good enough and is less expensive. Remember, better is the enemy of good enough. Several members of my family use your Protocol including myself. I am thankful to be free of the brain fog. My question is, will it help with strokes? My friend’s daughter had a severe stroke two years ago. She was 25. She still has cognitive issues. Improvement from strokes really need my protocol along with the added benefit of VNS during the rehabilitation exercises. Hi. Can we access the device or ship the device to Australia? We re introducing all other elements and have read your book. Very exciting! No, I’m sorry but we are legally precluded from sending vagus stimulators overseas. My father is sick and can’t move at all he has a breathing machine and he gets his food from his stomach. Is there something to do? Or it’s too late? I cannot honestly answer because I have never used our protocol on such an advanced state of LAS. Dr Nemechek, did you see the 11/18 60 Minutes interview with football player Tim Green? He now has a slow developing form of ALS, but is obviously affected. It was an emotionally moving story, to be sure. As I watched the segment, I wished there was a way to bring your knowledge to him! He and his family have started a foundation to bring awareness to other players. Hopefully with time our protocol will become more well-known.